Christmas cards are always a highlight of the season for me. I absolutely love sending and receiving them. I put a lot of time, thought and effort into our cards each year. This year we went with Vista Print and I was extremely pleased. I went back and forth with a couple designs but this one just stole the show. I loved that Josh and I were to the left of the card and all the verbiage was on the right, a bit different from what we've done in the past. I used a photo from our anniversary shoot, and while I was sad that Murphy wasn't on the front of the card with us, his bright and smiling face is on the back, not to be forgotten, that little kid :) This year we also decided to enclose a little "Colvin 2015 Newsletter" with our cards. I sawthis idea floating around and thought what a fantastic idea to recap the year. Before I got the verse put on the back of the card, I sent it to Josh for him to look at and he said "We are not having a secular card. Where is the bible verse?!" He should have known better than to thank I was going to leave off a verse! I purchased an address stamp a couple months ago from Etsy that I used on the back of the card and I got some washi tape to add a little flare. I hope that all of our friends and family receiving our cards as much as I loved making, addressing and sending them out! Oh girl, I love them! The red and green are the perfect amount of color, and of course, y'all's picture is just adorable! Which Etsy shop did you get your stamp at? I've been looking at some different ones, but decided to wait until we buy a house. 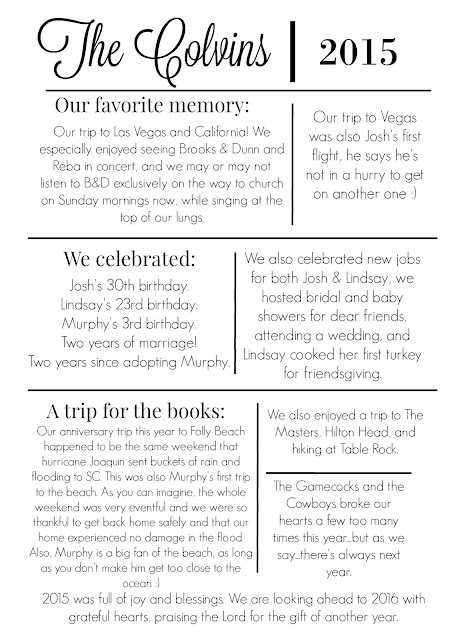 I love the idea of doing a newsletter, such a great way to share about your year!! I love them so much!!! We have used Vistaprint the last 3 years (and also for our wedding invitations and announcements), and they have never let me down. But choosing the design is for sure the hardest part! It seemed like every one that I loved this year had the words going through our faces hahah. I really love your little newsletter too!